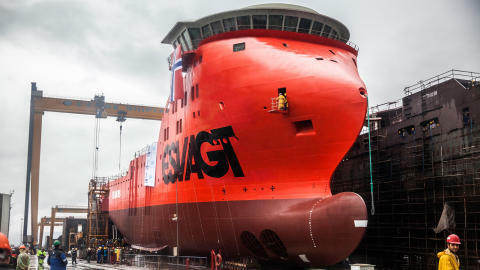 ESVAGT’s first service operation vessels for offshore wind farms are well on the way. The vessels, HST 118 and HST 119, that will function as service vessels for Siemens Windpower are both equipped with a gangway system that – via an advanced gyro compensating system – ensures safe transfer of service technicians between the vessel and wind turbine. The Norwegian company, Havyard Ship Technology, designed the HST 118 and HST 119. The hulls are built at the Cemre Shipyard in Turkey, after which the vessels are towed to the Leirvik Shipyard in Norway where they are fitted out, tested and taken into trial. The HST 118 was launched in Turkey on the 19th of July and is now in Norway. The vessel will now be equipped with the most modern technology to ensure a high level of operating safety, excellent energy efficiency and optimal comfort. 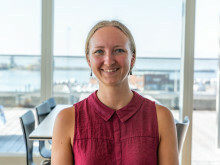 ”Our contact with Siemens commits us to ensuring that two technicians can be set down on five wind turbines within a set time frame,” says Kristian Ole Jakobsen. “Dynamically positioning a vessel typically takes between 20 and 30 minutes depending on the vessel’s propulsion and thruster systems, the accuracy of its DP systems and the local weather and wind conditions. We can position the vessel faster because we have developed a more advanced system with wind farm operations in mind. This system ensures that we can safely position the vessel to transfer service technicians between ship and wind turbine with the gangway system much faster than we can with existing dynamic positioning systems on other vessels in the ESVAGT fleet. Our plan is that the system will allow us to calculate the next positions before we get there, so that we can take wind, weather and current into account before arriving. We will also reuse data from the first positioning manoeuvre to optimise reaction time,” says Kristian Ole Jakobsen. Another distinctive feature of the HST 118 and HST 119 is that the vessels are equipped with a new and advanced main distribution system based on DC (direct current). Direct current has been used for many years with low current for advanced control and operating systems. Modern developments now mean that direct current can be used for high power distribution systems, making them an alternative to conventional maritime AC systems. This means that the vessel’s diesel generators supply power at variable and typically lower RPM than before – leading to a reduction in fuel consumption, noise, vibration and wear and tear on rotating machinery. ”The new power distribution system is a big advantage. Partly because it reduces emissions (CO2, NOx, etc. ), which is definitely important both for the customer and for us; we are, after all, working in a wind farm that produces green energy, and partly because it means less vibration and noise from the engines and increased comfort for those on board. This will benefit service technicians working or resting on board and the crew, who will have a much more comfortable working environment in the machine rooms. There will be less rumbling and noise on board the vessel. When we go from the typical 1600 to 1800 RPM to around 900 to 1100 RPM depending on the load, we also reduce wear and tear on the motor. This will lead to longer intervals between services,” says Kristian Ole Jakobsen. The vessels HST 118 and HST 119 will service the turbines in the Baltic 2 wind farm between Møn and Bornholm from January 2015 and for the following five years. From March 2015, they will also service the turbines in the Butendiek wind farm located West of the island of Sylt in the North Sea. The contract is not only the first wind energy contract; it is also the largest in the history of the shipping company. ESVAGT is to deliver two newbuildings to service the offshore wind farms in the Baltic Sea and the North Sea. ”An important business unit to strengthen”, says Søren Nørgaard Thomsen, CEO. ESVAGT’s two new service operation vessels will function as top modern workshops, stores, offices and accommodation for technicians in the offshore wind farms. Transfers by boat or stabilized gangway. Good experience is being gained during work at the offshore wind farms Baltic 2 and Butendiek. ESVAGT opens a new chapter in the shipping company history with the HST 118.